Discussion in 'Dwarf Gourami' started by CarrieFisher, Apr 17, 2017. My DG is a total pig! Even stuff off of the bottom that I drop for the Pleco. The Pleco gets his veggies, still, but the big concern is that the DG is FAT!! I fed peas to the whole gang tonight and tomorrow, I think we'll fast, but beyond this, anything I oughta do? 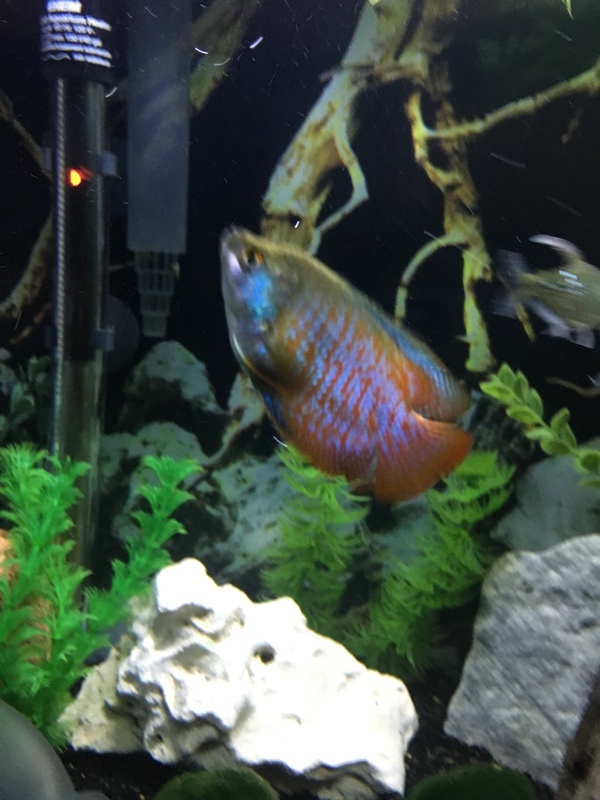 He's defecating normally, nothing abnormal there, just getting verrrry chubby after he scavenges the entire tank. @GlamCrab, does he ever chill out? Does his belly ever go kinda normal? I sit and watch them up close nightly and have never seen anything that would make me think of parasites. He's just a hungry hippo, I hope!! the female's belly is HUGE compared to the male. but she acts completly normal like yours..
atleast ever since they discovered the cory's food. There is literally nothing that he won't eat!! She really doesn't at all!! blegh, my screen made it looked like my original reply had spammed multiple times but anyways. No worries, im just grateful for your response, at all! My DG, Otto, is definitely a piglet too. Eats everything. Beautiful flame DGs did you get m&f at the same time? Do they get along well? Carrie, what an awesome looking natural colored DG !!!! Keep him healthy and think about breeding (This is a good looking healthy fish). Keep up the algae / veg part cause that's what most DG-diets lack. And try not to overfeed. And last but not least : don't keep it to warm (trigger for matingbehaviour : agression). Not that I can possibly take credit for it, but thank you!! Such a great thing to say!! I'm trying really hard to give my whole community a *very* varied diet. I even occasionally find him taking nibbles at The Fat Man's (the plec's) veggie clips. I'm trying to keep them at approx 76/77F, but (tbh) my Eheim Jäger has been NOTHING but trouble since day one. I'm also really excited to hear that he looks healthy; i think many here know me as "that nutty chick who freaks out about the tiniest things with her fish and tank, and has a little bit of a potty mouth"
My black neon tetras are total pigs too. One in particular, Bully, hovers over cories for crumbs. I've even witnessed her steal a piece right out of the cories mouth! Unfortunately, she does start to swim crooked when she's had too much. It's a battle to feed them. When upyou say "swim crooked", do you kinda mean that when they hover, theyre kinda tilted? Yes! She is nose up sorta, like her nose is pointing to 1 o'clock and she's "bouncy". That fish is something else! Question Mystery Snails Fighting? Mating? Just A Piggy Back?